Last night I was tidying up the house in anticipation of my friend Ross visiting for the weekend. I put my sunglasses away because I figured it would be a very long while before I needed them again. I am very happy to report that I was wrong. 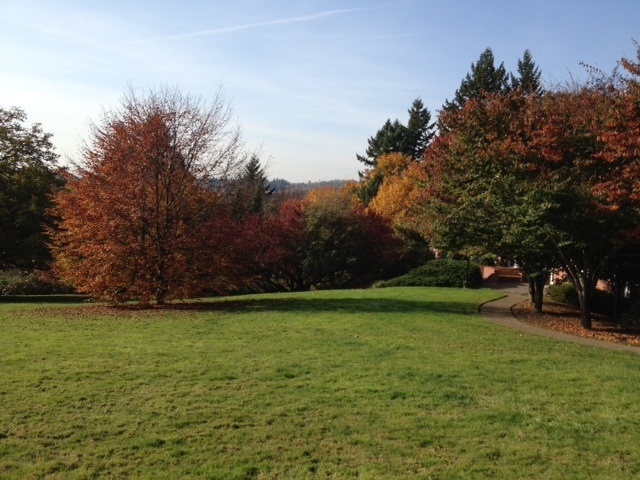 I stepped outside to take a picture of the rolling hills, the blue sky, the green grass, and the pretty trees – some of which are wearing their fall colors. I hope the weather holds all weekend, but if not I am still grateful for this spectacular fall day. Sun! Yay! I also recently had one of the best meals I have ever had at the restaurant Kin. I hope they do well since I’d like them to be open for a long time to come. Tomorrow I hope to eat breakfast at Hellser’s and lunch at Clyde Common. I am SO looking forward to this weekend which, lucky me, starts tonight!